There are a few tricks we’ve learned while packing thousands of homes for local and long distance moves over the years. Today we want to share with you some valuable house packing tips that you can use whether you hire a moving company to move you or opt for a DIY move from start to finish. The heavier the item, the smaller the box. While moving boxes are made of heavy duty cardboard, its weight bearing capacity is not unlimited. While a small box packed with books will do just fine, the same cardboard might not be able to handle double or triple the weight of books you are physically able to fit in a large box. It will break, slowing down the movers and potentially damaging the contents of the box. Super heavy large boxes will also require 2 persons to handle because a combination of weight and dimensions might make them unsafe to be carried by just 1 person. Uniformly sized moving boxes will make your move go smoother, save you time and money in the end. A note on using recycled miscellaneous produce boxes: these will be harder to stack, requiring more time from the movers and possibly putting your belongings at a higher risk of getting damaged. Oftentimes boxes you can salvage from a grocery or liquor store are made of very thin cardboard that has also become weakened from the moisture of transportation or product spoilage, and simply put, pretty beat up by the time you get them. They are simply not sturdy enough for moving. Remember: ripped boxes = broken valuables. Additionally, beware of insects that often infest used boxes, which might be home to nasty bugs. Costly pest treatment for your new home is the last thing you would want! Small and medium size boxes are king! You will need more small boxes than any other, and more medium boxes than large boxes. These are perfect for heavier objects like books, records, cans and jars with food, utensils and flatware. You may not know the exact number of boxes you will need, but it’s a safe bet to purchase greater quantities of small and medium boxes than any other size. Only use packing tape to seal your boxes. Regular duct tape does not adhere well to corrugated cardboard and boxes taped with it will open or fall apart. Besides, packing tape is often less expensive than duct and other tape, so go the extra step and get special packing tape. It is easily available at most hardware stores, as well as sold by most moving companies. Check to see if you have original boxes for your electronics. Those were custom made to keep your particular TV safe during transport. Use all factory-packed protective foam inserts if you have them, close and tape the box and you are good to go. If you do not have the original boxes, our advice is to leave packing your precious fat screens to the pros. Most moving companies carry specialized TV boxes that will provide the best protection from accidental damage. If you have to choose just one thing that you have your movers pack for you, make it your big screen TV as it would be very costly to replace. Label or color code your boxes. Get several different colors of tape or sticky notes and use them to color code your boxes according to the new room in which you want them placed. Knowing that all blue tagged boxes go to the kitchen and all red ones in the basement will speed up your unloading at the new home tremendously! This will also help prevent misplaced boxes which you will have to carry to the right room yourself while unpacking, long after your movers (or strong helper friends) are gone. Alternatively, write the name of the room on each box with an extra thick marker. Get rid of everything you don’t love or need. The more you eliminate, the less you’ll have to pack, the less money you end up spending on packing supplies and the shorter time your move will take, saving you money on moving labor time. Get some great tips on decluttering here (find a good link). Schedule a free donation pick up by your local charity or thrift store or ask your movers if they can drop your stuff off at nearest donation center for you. Not sure what can be donated where? Check out an excellent guide here. Sell things you don’t want to donate online. You’ll feel good about extra space gained and money saved! Let us break it to you – packing calculators are useless. The truth is, most online packing calculators are completely useless. There are a ton of them online but unfortunately most of them are not even remotely accurate, because they are based on the number of rooms. There isn’t a standard size for a room, all rooms are different. Unless you come across a calculator that factors in the square footage of your home and asks for basic inventory of your belongings, don’t waste your time. Get an idea of how many moving boxes you will need based on square footage of your home below. Make sure the place you buy your boxes from will accept return of any unused ones in case you have some left over, and buy a little over recommended amount. You don’t want to waste your time running back to store to get more boxes in the middle of packing. 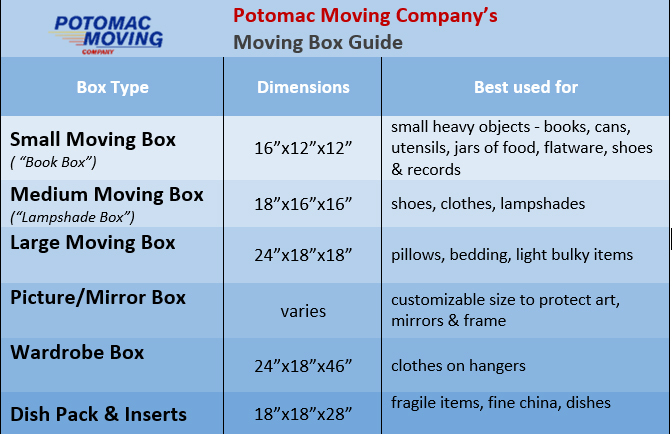 Most reputable movers, including Potomac Moving Company, will pick up and refund any unused boxes you purchased from them at the end of your move. What Size Boxes Do I Need for Moving? 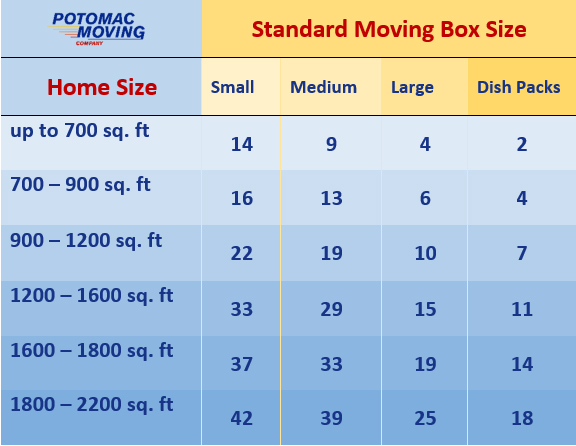 Standard moving boxes come in several fixed uniform sizes. Here is our guide to help you better determine the appropriate box size and type for various items. Following this guide will help properly protect your belongings, as well as save you time and money by making the loading, stacking and unloading process much more efficient.